Back in December 2011, DEAF LIFE published a brief writeup about MtvU's documentary Quiet Campus, which focused on four Gallaudet University students. Cesar Ayala was one of the four students profiled, and he responded to our questions with exuberance. We figured we'd be doing a story on him later. On October 15, 2017, Ayala was chosen Mr. 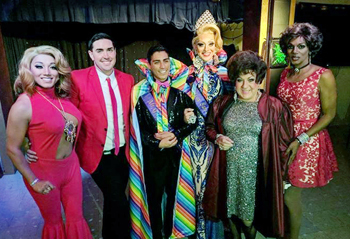 Gay San Francisco by the Imperial Council of San Francisco, becoming the first Deaf titleholder in the Pageant's 46-year history. A bit of background: The Imperial Council of San Francisco was founded by José Julio Sarria in 1965, as the original chapter in the Imperial System, an international nonprofit LGBT organization. Sarria (1922-2013) was a courageous early gay political activist and drag queen/singer. In 1961, when homosexuals were still being harassed and arrested, and gay bars were periodically raided by police, with detainees names’ printed in newspapers, he became the nation’s first openly gay candidate for public when he ran for the San Francisco Board of Supervisors, and almost won a seat; he got 6,000 votes, coming in ninth, showing that gays were an important constituency. (Harvey Milk finally won this Board seat in 1977.) As Sarria noted, “From that day on, nobody ran for anything in San Francisco without knocking on the door of the gay community.” He also said, “There’s nothing wrong with being gay–the crime is getting caught,” and “United we stand, divided they catch us one by one.” He co-founded the Tavern Guild, the first gay business association, to assist with legal advice. He reigned over the Imperial System for 43 years, abdicating in 2007. Cesar Ayala, who attended California School for the Deaf, Riverside, from ages 5 to 18, never experienced bullying. He credits this self-confidence to his mother's support and encouragement. He got involved in dance/drama and cheerleading in middle school. "I've been coaching CSD Fremont's high-school varsity cheerleading squad for three years."" He praises CSD's openness to diversity, "inclusive of LGBT, disabilities, and people of color." He had a great time at Gallaudet University,. He ws involved in cheerleading, Buff and Blue newspaper, Tower Clock yearbook, Bison Song Team, Kappa Sigma fraternity, Leadership Class, and more. He was 76th Homecoming King, the first Gay Latino Homecoming King in GU's history. And was first runner-up for Metro Weekly's 2009 Coverboy of the Year. Before graduating in 2012, he decided to move to Austin, Texas, which has a good Deaf community, but after receiving a semester's scholarship at San Francisco Art School, he decided to explore the unknown. "After I survived one semester, I knew that the Art School wasn't for me," but received a job offer: Toolworks Resources/People with Disabilities. Then he joined CHEER, San Francisco's official cheerleading squad. One of the CHEER members urged him to join the competition for Mr. Gay San Francisco. So he did. As he told the judges during his interview, "I have three identities inside me. I'm Deaf, Gay, and Latino." During his life, he had struggled with many obstacles because of those intersecting identities. He said, "If I win the title, I want to share my life experiences. I'll change people's lives. I want you to treat us like humans. The most important thing is LOVE. We are all humans and [should] love each other." As part of his official duties, h helps represent San Francisco. "Hopefully, I'll have a chance to talk with the Mayor an discuss the Deaf community and disability issues," and travel to most of the Imperial Council's 85 chapters to give "presentations about the LGBT Deaf community, Deaf-plus (deafblind, wheelchair users, etc. ), and people of color. This is my chance to spread a powerful message for better access. My dream is to break down barriers."